Galion Graders starting pitcher Tyler Hall works during the first inning of Saturday’s game against the Grand Lake Mariners. The Mariners won 7-2. GALION — Timely hitting can be the difference between a win and a loss in baseball. 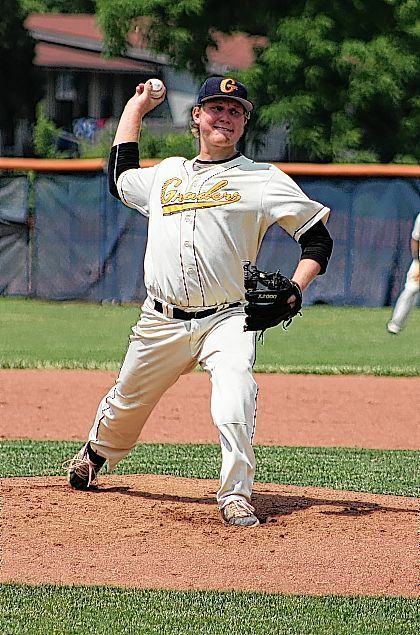 On Saturday afternoon, Grand Lake was the beneficiary of some timely hitting, especially in the first inning, and cruised to a 7-2 victory over the Galion Graders in Great Lakes Summer Collegiate League action. The Mariners (5-1) also a solid performance from starting pitcher Curtis Wilson, who worked six innings and held Galion to just one run on three hits to earn the win. Wilson recorded four strikeouts and one walk. Grand Lake scored three runs in the top of the first inning to stake themselves to what turned out to be an insurmountable lead. Galion starting pitcher Tyler Hall hit Mariners lead-off man Aaron Bence to open the game and, with one out, number-three batter Alec Turner got aboard on a fielder’s choice. Clean-up hitter Josh Williams clubbed a double to left field that drove in Bence, and Hayden Rappoport’s ground-out to first base allowed Turner to cross the plate. Williams extended the Mariners lead to 3-0 when he scored on an infield single by Derek Parola. Hall struck out the last batter of the inning to end the threat. The Graders (2-6) didn’t mount a serious threat of their own until the home half of the fourth inning, when Brody Basilone led off with a double to deep center field. With one out, Mark Delas drove a single through the right side of the infield that allowed Basilone to score and cut the deficit to 3-1. A walk to Jake Krupar gave Galion two runners on base. Hunter Clanin then slapped a single to right field, but Delas was out on a force play at third. Tyler Ocker grounded out to end the inning and Galion left two men on base. Grand Lake extended its lead to 4-1 in the fifth inning when Turner’s double to right field scored Bence. The Mariners took a 5-1 lead in the sixth thanks to a Colton Bradley sacrifice fly that gave Tyler Frank time to trot home from third. Galion pulled a run back in the eighth after Brandon Wright reached base on an error by the Mariners shortstop, advanced to third on a throwing error by relief pitcher Jack Fossand, then scored on a single to left field by Zack DeThomasis. However, the Graders stranded two runners when Grand Lake pulled off a double play to end the inning, leaving the Graders trailing, 5-2. The Mariners added a couple of insurance runs in the top of ninth. Tristan Mercadel bashed a two-run home run over the right field fence to round out the scoring. Galion’s Alexander Malinsky reached base in the bottom of ninth on an error with two outs, but Grand Lake reliever Austin Rodesky induced a ground ball from Aaron Caputo for the third out. Parola led Grand Lake at the plate, going 3-for-4. Grand Lake finished with 10 hits and left five runners on base. Basilone went 2-for-3 and Delas finished 2-for-4 to lead the Graders. Wright, DeThomasis and Ocker each had a hit. Galion left seven runners stranded. Hall took the loss for Galion after giving up five runs on eight hits in seven innings. He finished with three strikeouts, a walk and a hit batter. Nick Muse looked sharp during his one-inning stint in the eighth. He retired the Mariners in order on a fly ball, ground ball and a strikeout. A.J. Cecil gave up two runs on two hits and recorded two strikeouts in his one inning of work in the ninth for Galion. The Graders and Mariners will face off again on Sunday at Montgomery Field in Celina. First pitch is set for 7:05 p.m.